Agreed. Had the other numbers been on it, it would look fine. Setting world time, travel through timezones! 8) Not much call for any of that in't Yorkshire, might be alret for timing whippets thou. I don't like BT but it's not a gimmick. It works but I don't personally want a watch that relies on me having my phone in my pocket. Lots of other people will, and do. I does make setting world time and alarms really easy and if you do travel through timezones you phone will update the watch. 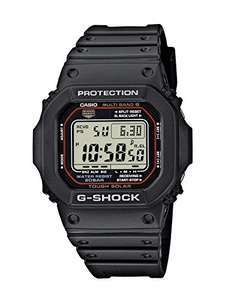 I'm a fan of G-Shock but this particular model seems kinda lacking in features. No waveceptor, no sensors ... yeah it has bluetooth but that's a gimmick. There's 3 issues with viewing angles on this model 1. EL backlight models always have worse contrast 2. The solar panel adds an extra transparent layer. It doesnt need to, but due to cost cutting thats how this model is manufactered 3. Crap LCD panel with somewhat of a panel lottery Combined and with bad luck in the panel lottery, it can be a real piece of garbage. 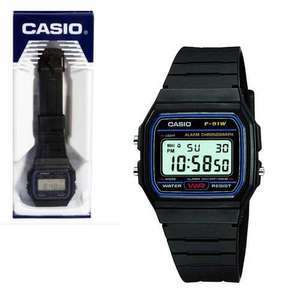 Worse than the cheapest Casio (F91W). I've taken my SATS and GCSEs so I no longer need a calculator on my wrist. I ordered an *like new* one from the warehouse a month or so ago for 75, new was 90. Checked the camels and saw it sells for that price new at times. I cancelled the order before it got delivered. Regret not actually taking delivery and checking the watch out before returning it. I have a very similar looking watch to this with the same features. Probably just a slightly different model variant and that too had no light. Not that I needed it but for the 16£ I paid I thought a light would be included as per previous cheap casios. The glow in the dark hands are just terrible, borderlining on making the watch seem a fake. They last about 10mins or so and that's after being out all day in the glorious weather we've had this weekend. As per another comment earlier, it does scratch, I have one deep one and another light scratch. Not bothered as it's just a 16£ watch (the one I paid for from argos) and also the watch face is pretty big. I bought one of these a few weeks ago. Bear in mind that there IS NOT a backlit display on this watch... which was the principle reason why I bought it. An RRP of £50 is utter fantasy. Had I known that there was no back light, I wouldn't have paid a tenner for it. Bought this watch for the same price a month ago. They are fine but I found it hard to figure out how to use its features. The instruction is not so clear so had to use Google and YouTube. Another downside- got scratches on the glass after just two days of very casual use. The scratches are tiny and visible only at certain angle but they are numerous. 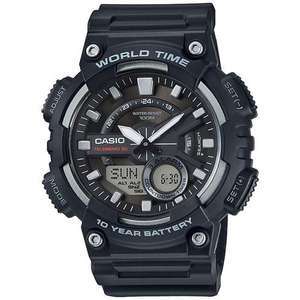 Overall, I m happy with this watch at this price. I bought them to use during beach holidays and occasional general use and hope they are fit for for this purpose. I can't belive you forgot the telememo feature, it's the main selling point! Store 30 or so phone numbers directly on the watch! If you don't have a watch then yes: the time. Anyone know how big the face is? I own this watch but in a different colour. It's very nice and has excellent features but be warned, it is very heavy. If you don't like heavy watches, don't get this. It's 299g I believe. Bought it two days ago for £30 from Amazon! Will return the new cheaper one and get my 30 quid back. Not sure. Will check later. I have already worn the first one I bought, and removed links. So I'm not going to return a used product. I will return an identical, original, factory sealed watch which I happened to get cheaper. Done this loads of times before. Just keep your receipt, and if a bargain comes along later, and the cost difference is worth it, and if you're still in the return period, buy the cheaper one, don't open it, and return it with the original more costly receipt. Then you've had a bargain! Wouldn't they both have different serial numbers? Got one. Feels cheap. Is cheap BUT looks like it’s good quality and worth a lot more. Get lots of compliments on mine! Picked up the gold one, always thought it looked really nice! Never miss a 'Casio' deal again! No used listing anymore, expired. I have a normal sized wrist, so judge by the photo. I like the larger size. 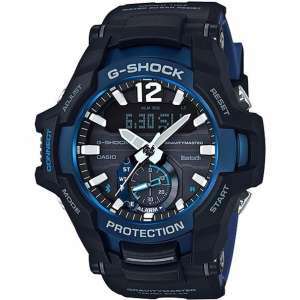 yeah got me a g shock - love it. Just wish the alarm was louder. Other than that, amazing bit of kit. Where every tag should stay lol! It is..... same model, different colour varient. Looks the same as this. Ah right..... I thought you meant a red version of the latest model. In red ? Not seen a red version. Ah, but this one's got "No bezel bezel." Would love to get this. Effectively a poor man's G-Shock. But my last Waterproof Casio just refuses to die!